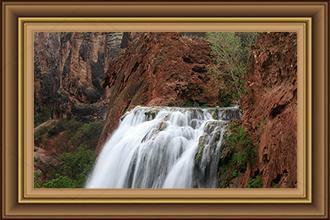 The 52 miles (84km) between Kingman and the Colorado River at Topock is the original Mother Road. 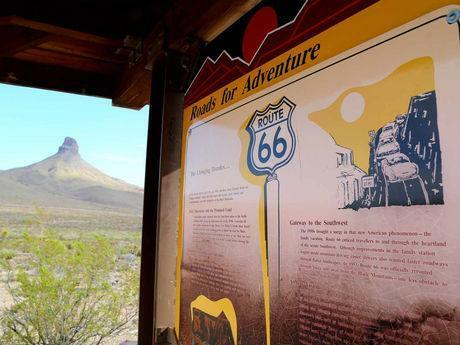 Predating the declaration of Route 66 in 1926, it was built for the stream of prospectors looking to stake a claim in the Oatman Gold Rush of 1902. It is representative of the Mother Road mentioned in John Steinbeck's "Grape's of Wrath" and best symbolizes Route 66 during the American Great Depression of the 1930's. By 1952, America’s love affair with big cars won over, and Route 66 was rerouted to the current alignment of I-40. Plan for 1.5 hours of drive time between Kingman and Topock, plus additional time to stop, take pictures and see the sights. Speed limits range from 25-45 mph (40-72 km/h). 11. Rockhounding at the BLM Thimble Butte pull-off is a fun family activity. Here you can find fire agate and chalcedony roses. Watch for snakes and desert critters in warmer months. 12. 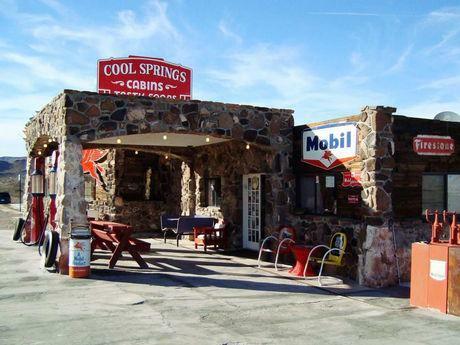 Cool Springs was the last service station before heading up into the Black Mountains. Much of the original structure was exploded in the making of the movie Universal Soldier. The building was rebuilt and now serves as a gift shop and museum. It’s also a great place stop, buy a soda and take in the views. 13. The Cuesta Fire Agate Mine has been in operation since 1928. 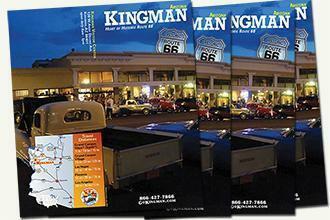 It is located on Oatman Highway (Route 66 west of Kingman) 4 miles east of Oatman. 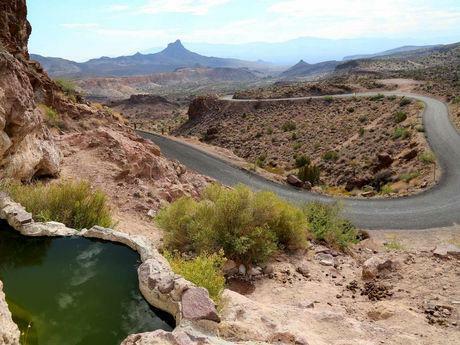 This scenic location offers a pay-to-mine service, contact the mine owner for more information regarding cost and availability: Don Nelson, 928.565.4145. 14. Radiator Springs anyone? Shaffer Fish Bowl Spring is located on Oatman Highway (Route 66 west of Kingman) shortly past Ed’s Camp. A natural spring leads down to a basin where there are several gold fish. A few stone steps, often with loose gravel and burro droppings, leed up to the spring capture basin and it’s quite a view over the valley below! According to Kingman resident Art Fuller, when the State Highway Department cut the road in near the spring, they built the stairs and small pool. In the mid 50's the highway department also added a hand pump drinking fountain into one of the holes in the rock and put a fine screen over it to keep out bugs and animals. Within a few years the State determined the drinking fountain was a liability and it was removed. But the pool remains today. Art Fuller’s father, Arthur F. (Bud) Fuller Sr., worked for the State Highway Department from 1946 to 1961. One of his duties was to take care of the spring during the time the family lived in Oatman, 1946-1953. Other residents report that travelers sourced it for water to fill canvas bags or the radiator as they drove up the old highway. Perhaps there’s more historical context to Radiator Springs than Disney/Pixar realized in the movie Cars. It seems that knowing where springs were along the highway was important for drivers who needed to top off a radiator from time to time. A word of caution – watch for bees gathering water from the cool spring! 15. Sitgreaves’ Pass was first mapped out by Captain Lorenzo Sitgreaves in 1851 while on an expedition to see if the Colorado and other rivers could be navigated by steam boat. 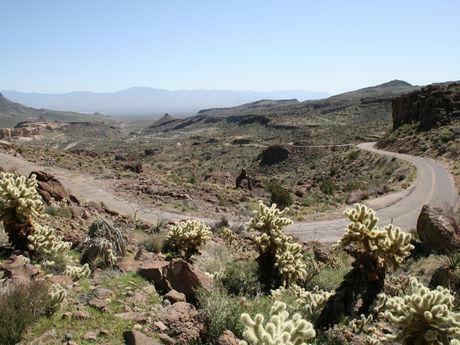 From the top of the pass at an elevation of 3,550ft (1,082 m), you can see the across the Black Mountains into California and Nevada to the West and across the scenic switchbacks to the Hualapai Mountains in Arizona to the East. 16. 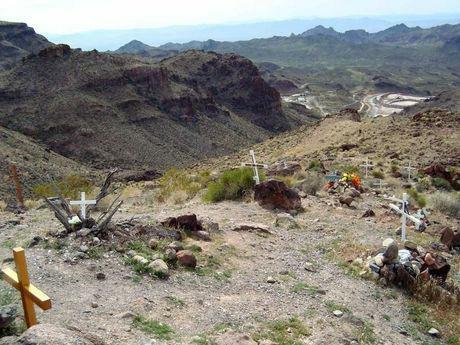 Check out the Route 66 Memorial Hill just past Sitgreave's Pass overlooking Gold Road Mine. Dozens of crosses and other remembrances dot the hillside. It's interesting, quirky, and kind of eerie. Better yet, do this at night! 17. 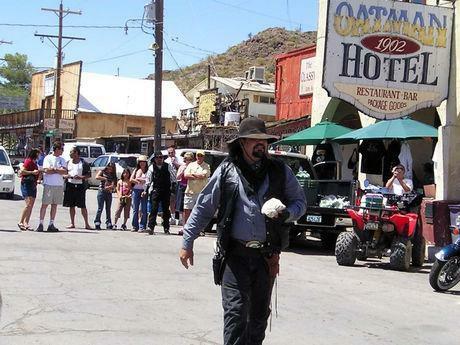 Gunfight reenactments in Oatman occur two or more times daily – depending on the crowd’s demand – but always starting at high noon. Always a fun sight to see, the local miners have been putting on a show for years. 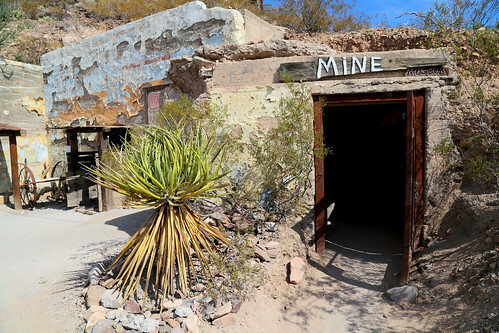 Turns out, Oatman miners didn’t stop mining when the gold ran out, they just moved operations from the dried wash beds in the hills to the flowing stream of travelers. 18. 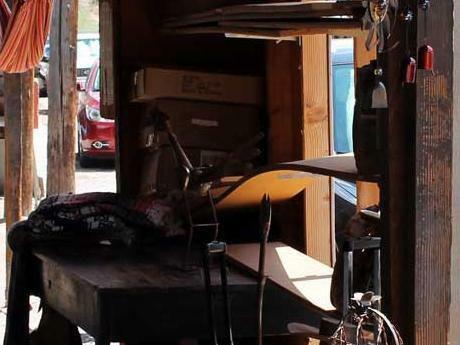 Meander through the eclectic shops on Oatman’s wooden boardwalk. Oatman hasn’t changed much since the gold rush days, still the same old buildings slapped together of whatever settlers could find. However, the shops and bars don’t cater to the Miners coming out of the hills, but to the travelers coming down the road. They have a quirky selection of trinkets, art and apparel to browse while enjoying the Oatman hospitality. 19. Oatman Stables is only open October through April, but that’s because it’s the best weather for going horseback riding. They offer ½ hour, 1 hour and 2 hour wagon or horseback rides into the rugged Black Mountains. Reservations are highly recommended. 20. Topock Marsh is a 4,000 acre marsh located where Route 66 crosses the Colorado River. 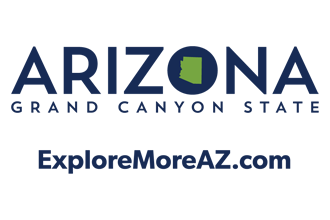 As part of the Havasu National Wildlife Refuge, a popular bird watching area with over 300 species of birds (click here for species lists). Topock Marsh is a good location to explore by canoe or kayak. If you don’t have your own watercraft, there are a few businesses in the area where you can rent boats, canoes and kayaks. Thank you for visiting http://www.gokingman.com/heart-of-66-west! Be sure and revisit gokingman.com frequently for content updates and more.